UAMS Chancellor Cam Patterson, M.D., MBA, and Mary Cantrell stop for a photo at the Employee Services Awards ceremony. 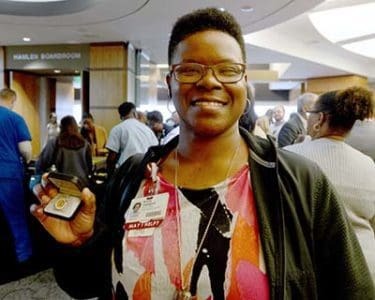 Nov. 20, 2018 | UAMS honored 1,350 employees for their years of service in ceremonies on Oct. 30 and Nov. 1. The Oct. 30 ceremony recognized 311 employees with 20, 25, 30, 35, 40, 45 and 50 years of service. Robert Burns, Ph.D., a College of Medicine professor of Anatomy and Interdisciplinary Toxicology in the Department of Neurobiology & Developmental Sciences, was honored for his 50 years of service. 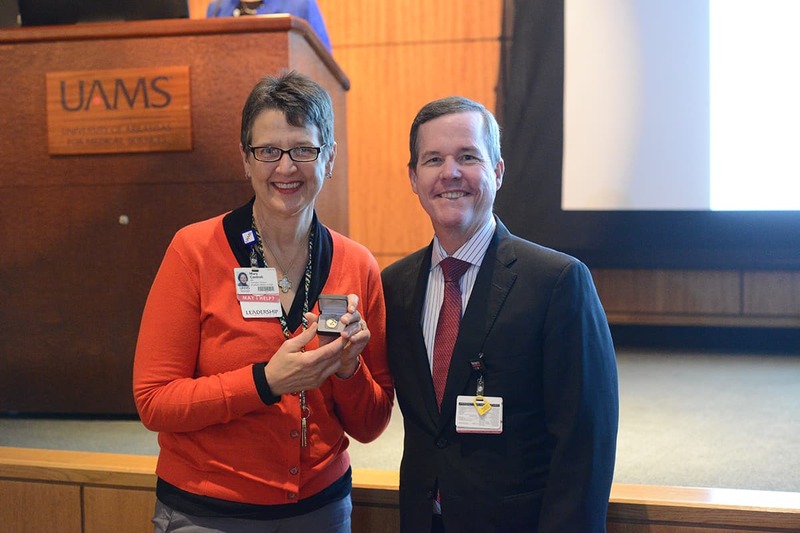 Kristy Caldwell holds up her pin recognizing her 15 years of employment and service at UAMS. Robert Arrington, M.D., a professor in the Neonatology Section of the Pediatrics Department, and T.K. Short, an administrative analyst with MCPG Payment Processing, were both recognized for working at UAMS for 45 years. Fifteen employees were recognized for 40 years of service at UAMS. Click here for short biographies on the 18 employees who were recognized for 40+ years of service. More than 1,000 employees with 5, 10 and 15 years of service were honored at the Nov. 1 reception. Chancellor Cam Patterson, M.D., MBA, applauded the employees for the commitment they made to UAMS. “On behalf of everyone at UAMS, I applaud you for the good you have done, the work you have contributed, the assistance you have provided, the knowledge you have conveyed, and the time and talent you have dedicated to all of us and to the students and patients served by this great institution,” Patterson said. Jeff Risinger, vice chancellor for human resources, called the employees’ years of service “a gift to the people of Arkansas.” “It is only fitting that today we say thanks,” he added. Department leaders then called out the names of the employees being honored. Each employee came forward to take their picture with Patterson. A reception followed the ceremony.